By using simple, inexpensive, and readily available materials, researchers at at the University of Rochester have developed an optical system that can actually hide objects in the visible spectrum of light. Cloaking devices are a kind of holy grail for physicists. The ability to hide objects from plain sight would be a remarkable achievement with applications ranging from medicine to the military. To date, efforts have been unwieldily, bizarre, and limited (i.e objects re-appear when gazed at from different angles). Sure, researchers have managed to hide certain wavelengths of light, but namely those in the part of the spectrum we can't see. According to the researchers, the new device is the first to do three-dimensional, continuously multidirectional cloaking, which works for transmitting rays in the visible spectrum. Now, while the new system developed by the University of Rochester researchers won't conceal you completely, it could eliminate blind spots in vehicles or let surgeons see through their hands during complex operations. 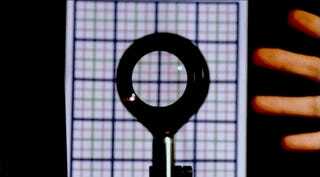 John Howell, a professor of physics at the University of Rochester, along with graduate student Joseph Choi, combined four standard optical lenses that keeps the object hidden, even as the viewer moves side to side. Admittedly, the set up is not quite perfect. "This cloak bends light and sends it through the center of the device, so the on-axis region cannot be blocked or cloaked," said Choi. The cloaked region is essentially shaped like a doughnut, but the researchers have already built slightly more complicated designs that solve the problem. Separate the first 2 lenses by the sum of their focal lengths (So f1 lens is the first lens, f2 is the 2nd lens, and they are separated byt1= f1+ f2). Read the scientific paper here. It's slated for publication in the journal Optics Express. Credit: J. Adam Fenster / University of Rochester.